Many sites along the Trail bring local fisheries history to life with interpretive panels. The Downeast Fisheries Trail extends from Penobscot Bay to Passamaquoddy Bay along the region known as Downeast Maine, so-called because the prevailing winds pushed fishing schooners downwind and eastward, in the great age of sail. But you don’t need a boat to travel the Downeast Fisheries Trail. Although several sites are indeed accessible from the sea, all 45 sites on the Downeast Fisheries Trail can be accessed from the road. It might take several days to visit all of them; the distance between the Penobscot River and the Canadian Border is about 115 miles or three hours along US Route 1, but the journey east can take much longer when following the shoreline of the peninsulas that characterize this region). While this comprehensive journey is well worth it for those who have the time, Maine’s fisheries heritage can be explored just as well by building a travel itinerary around several sites (in a region or around a bay) or themes (such as lobster or working waterfronts). Most of the Downeast region is fairly remote. This remoteness provides the character and scenic beauty of the region, but travelers should be prepared for inconsistent cell phone coverage and sometimes distant fuel stations and other conveniences. However, there are plenty of places to stay and eat. 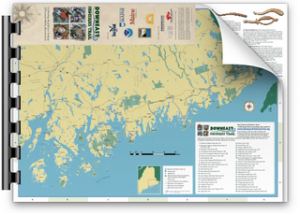 For lodging and dining options, events, activities, great maps and more, check out the Maine Office of Tourism and it regional affiliate DownEast Acadia Regional Tourism. A number of events and activities occur at Downeast Fisheries Trail sites, and connections to Maine’s rich fishing heritage are never very far away. If you’re a poet or a writer, perhaps a visit might inspire you to write and submit a piece to our online literary journal, The Catch.